Like any other exciting experience in our lives it usually goes by too quickly. Here we are already at the end of day 6. Like many of the other places and things we’ve seen it has been full of amazing images and experiences. 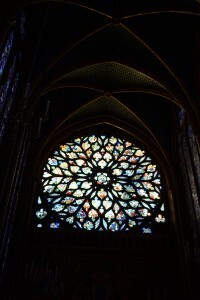 Being my first time in Paris I see things with new eyes and everything truly does exceed my expectations. Today we got to visit one of the largest museums in the world. The Louvre! The excitement for me to visit these images that I have seen countless times in the classroom was at a high for me. These are paintings I’ve seen, discussed and analyzed in class. 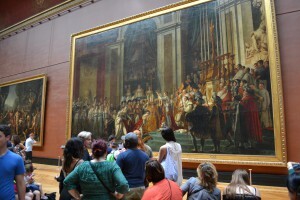 To see them in real life, well there is nothing like it for such a big Art History fan as myself. 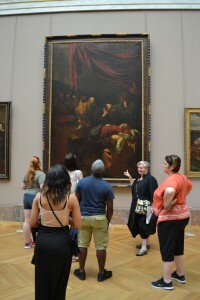 For many of my classmates it was their first time getting a chance to hear the history behind these master works. Each painting we stood before today was rich in history and in these works of art, history and literature also come through. Professor Cadero-Gillette and Professor Salmon shared with us all their knowledge and important Literary and Historical facts about each of the paintings. We spent the entire day and we covered a lot of ground and a LOT of information. 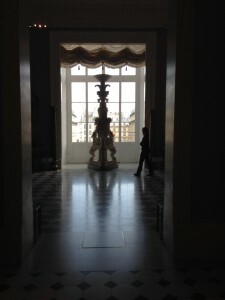 Of course we only did see a small fraction of the collection here at the Louvre. 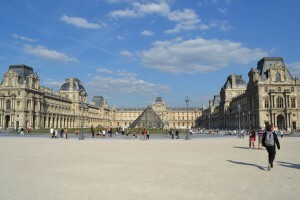 It is of course the largest museum in the world at 625,300 total square feet. Definitely too much to see in one day. We began our visit by starting out in the section of the museum where we could see spectacular rooms set up in Baroque and Rococo style. Rooms with lavish decorations a from floor to ceiling filled with furniture and decor. 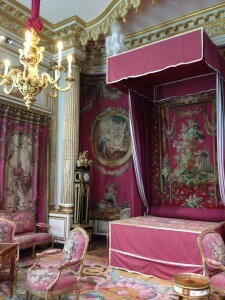 What is truly amazing is that these rooms are not replicas of what once existed, they are actual rooms that were dismantled and put together at the Louvre. Of course we did venture over to Italian Renaissance and braved the room where the Mona Lisa hangs behind a large pane of glass flanked by museum guards. I could not believe how packed the room was and apparently it wasn’t as bad as in past years. 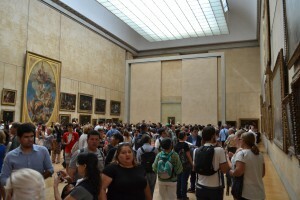 Some of us were brave…no crazy enough to try and squeeze through the crowd, get pushed, hit and poked on the way there just to get an up close view of this famous masterpiece by Leonardo da Vinci. After the long morning walking through the halls of this magnificent building we stopped for a much needed break before continuing or journey through the museum. Lunch had to be in the cafe on the property since leaving the Louvre during the day and trying to go back in, well lets just say it’s not a good idea. Over lunch we discussed a brief history of France and tried to put together all the information we had heard and discussed thus far. I am really looking forward to tomorrow and what it has in store. 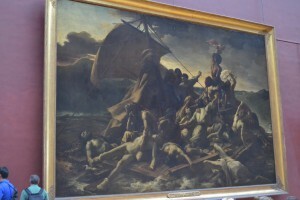 For now I’ll leave you with a few images of some of my favorite paintings at the Louvre. 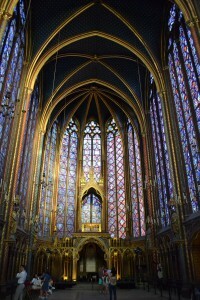 Oh…one more thing I’d like to share are some pics of Saint Chappelle a royal chapel in gothic style Hannah and I had a chance to visit after our trip to the museum. 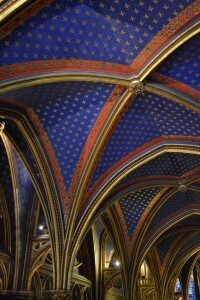 Lucky for us the Chapel was open late for the evening.